History: (Defenders I#115 (fb)) - 'Here' is a dimension split in two halves and populated by cartoonish talking animals and plants. The denizens of both sides of the world refer to their side as 'Here' and the other side as 'There.' At one point, an ancient poet, sage, and grouch named Nostradicted wrote 'the Book,' which prophesied that his side of the kingdom would one day be at war with the other side, but that 'They,' four other-dimensional heroes, would arrive to stop the war. (Defenders I#115 (fb)) - Tired of the other side calling his side of the land 'There' when he called it 'Here,' Mayor Easyread instructed his fiends, finks, and flying ginks to begin a war with the other side. Mayor Easyread employed Thorton to act as his special guard to dissuade all anyone from attacking Easyread's castle. The inhabitants of the other side, including the rhyming Mayor Greeneggs and the whispering Annham, grew tired of the war as they never knew what the cause of the war was. (Defenders I#115) - When four heroes (Beast, Gargoyle, Sub-Mariner, Valkyrie) landed in 'Here,' they were greeted by Greeneggs, who told them where they were. When Annham recognized the heroes as 'They,' he whispered in Greeneggs' ear, and Greeneggs led the heroes back to City Hall where he showed them 'the Book' Nostradicted had written. An outburst from the Sub-Mariner caused Greeneggs and his allies to cry. To help convince the heroes to join them in stopping their war, Greeneggs (reminded by Annham) told the heroes of the Ruby Sneakers, a magical artifact that would take them home when the heels were clicked and the words 'There's no place like the place I came from before I came here!' were spoken. The heroes agreed to help them, and after a celebration with dancing and a roasted banana, they equipped for war with plastic swords. The army and the heroes rode on fishback across the strawberry malted river. Easyread saw the approaching heroes through his telescope, and ordered Thornton to deal with the enemies, the tomato-throwing catapults to be equipped, and creme-filled cookies to be brought to him. Thornton, who despised violence and told everyone about it in lengthy speeches, attacked and trapped several of the creatures in the bubbles from his bubble-blower. The heroes tried to attack him, finding his body to be made of gooey putty. He quickly put them to sleep with a long speech. Having had the foresight to plug their ears with sand, Greeneggs and Annham escaped Thornton's clutches and confronted Easyread. They spanked Easyread until he agreed to stop the war. After the heroes were freed, they learned the motivations behind the war. Annham presented Sub-Mariner with the Ruby Sneakers, since they were his size, and he used them to transport them back to their native dimension. The slippers remained with him, proof that the adventure actually took place. Comments: Created by J.M. 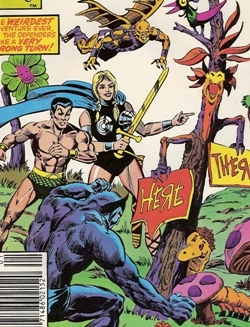 DeMatteis, Don Perlin, and Hilary Barta. In the Generation X miniseries Daydreamers (the one that had Franklin Richards, Howard the Duck, Tana Nile, Leech and Artie in it) I think they visited Here (and There) in one of the issues, or someplace that could have been a divergent from There. I'm not sure that any of the places they visited in Daydreamers were "real," but rather figments of Franklin's imagination. I think a letter page pointed out that the Ruby Sneakers did not do what they were supposed to do, because the Defenders had actually come from Earth-712 (the Squadron Supreme's reality) and were sent to "Here (and There)" when a cockroach disrupted a circuit in the teleporter. I recommend the name "Lesieg" as the true name for this dimension. No known connection to anyone not mentioned in this profile. As Mayor of Here, Greeneggs grew tired of Here's battle with Thornton and Mayor Easyread of There. When 'They' arrived, Greeneggs and Annham moved with them to battle. Having escaped Thornton's clutches by stuffing their ear with sand, Greeneggs and Annham defeated Easyread themselves. their ears with sand and defeated Easyread themselves. As Mayor of 'There' (though he thought it was 'Here'), Easyread engaged in a long battle with the land that called itself 'Here.' Easyread sent his forces into battle, and had Thornton act as the guardian of his castle. In time, Greeneggs and Annham defeated Easyread by spanking him. Thornton, guardian of 'There' (though he thought it was 'Here') and ally of Mayor Easyread, used his pliable body, bubble blower, and sleep-inducing speeches to defeat his prey. He was thwarted by Greeneggs and Annham, who escaped his clutches by stuffing their ears with sand.